Earn up to 1,912 reward points. Get the right level of high gain, and lose the unwanted feedback. 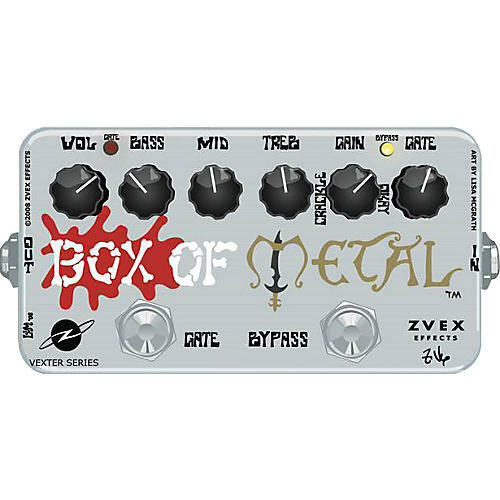 The ZVex Box of Metal is an aggressive high-gain distortion pedal with a highly effective built-in switchable gate which dramatically reduces noise and unwanted feedback. Its gain and tonal characteristics are somewhat similar to high-gain tube amplifiers that have been the staple of hard rock and metal sounds since the 80's. On the right, the guitar effects pedal has a true-bypass switch with an indicator LED to bypass the entire effect. On the left is a gate switch, that is only effective when the pedal is on (the gate cannot be used separately.) When the gate's LED (on the left side of the pedal) is on, the gate will be active whenever the pedal is turned on. The gate is very useful for cleaning up any noise between palm-muted chords and lead phrases, but may be switched off to initiate feedback or to stretch out soloed notes that are fading into noise. Switching off and on the gate is silent so the gating action of the distortion pedal can instantly be changed during any part of the performance to fluidly integrate soloing and palm-muted chords. Gate: Adjust for your playing style. When fully clockwise, palm-muting will create an audible thump and bumping the strings will open the gate. Turn down to make the gate tighter. Gate is unaffected by other controls. Drive: Sets the amount of distortion. The Box of Metal does NOT clean up. This control goes from hard to very hard. It may crackle when turned-this is perfectly normal. Treble: adjust for treble content. Use this in tandem with your amp's presence and treble controls to get the precise top-end texture-the presence control is very important on your amp, if you have one. Midrange: Adjust to accentuate or scoop out mids. Bass: Sets the bass/sub-bass level. Note that the LED on the right is for the bypass switch and the LED on the left is for the gate. The Drive and control is based on the original ZVex Super Hard-On gain control, so it may crackle when turned. This is perfectly normal. Plug your guitar (or any effect's output) into the right hand input jack. Plug the output into an amp or other effect's input. Enjoy in moderation. Watch the output volume setting...with the gate turned on you may not notice just how loud the distortion pedal is going to be until you play! Set the clean sound on your amp for any level of pristine cleanliness to heavy crunch. The Box of Metal should do very well driving any amount of nominal distortion. The presence control on your amp will have a strong influence on the top-end texture of your ZVex pedal. Current draw is approximately 10mA. Use a high-quality 9V adaptor for all high-gain effects. Your ZVex Vexter Box of Metal is warranted for 1 year from date of purchase, or 2 years if you send in your warranty card.